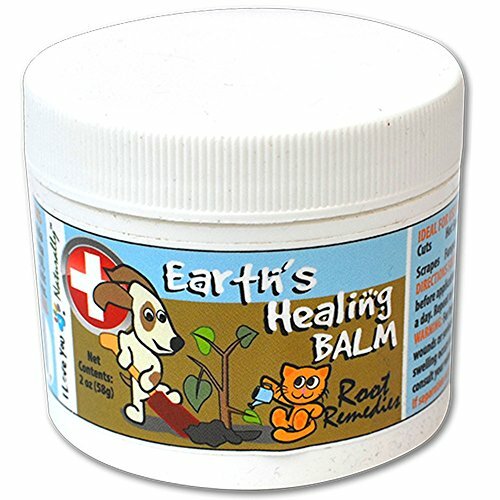 Our Earth's Healing Balm is one of our Natural and Herbal line's, I Love You Naturally, best seller. Because of its potency, a little goes a long way and it can be used for a number of ailments that your dog or cat can have. All of our I Love You Naturally™ products are animal cruelty free and contribute to no animal testing. Our products are tested on us to see if it is good for them! Most of our products are vegan, with the exception of the products with honey or beeswax. That is why we will always list the ingredients, to be completely transparent, for you and for your 4 legged best friend. All of our products are made with Human Grade Ingredients! can be used for cuts, hot spots, bug bites, cracked elbows, scrapes, Fungus, Dermatitis, inflammation, and painful sore aching paws just to name a few. ALL-NATURAL HIGH QUALITY CONCENTRATED INGREDIENTS: There are no toxic chemicals or unnecessary ingredients in our I Love You NaturallyTM Earths Healing Balm. We use all human grade, St John's Wort, vegetarian ingredients. All of our ingredients are simple and safe: Coconut Oil, Mineral Oil and Comfrey Leaf and Root just to name a few! Perfect for all breeds and sizes, 4 months and up. MADE IN SMALL BATCHES: We concoct all of our all-natural, pure herbal remedies in small batches to ensure quality and potency. We always include love, as an added value! EASY TO APPLY: Wash away dirt and debris before application. Apply balm liberally several times a day. Repeat as needed. RECOMMENDATION: Use with PawFlex Bandages, designed just for Pets! If you have any questions about this product by I Love You NaturallyTM, contact us by completing and submitting the form below. If you are looking for a specif part number, please include it with your message.